I took a morels class at Kitchen Conservatory last night with Brian Hale, executive chef at Monarch in St. Louis. My partner Gwen & I were in charge of making a ravioli...a first for me, which was much easier than I'd ever thought it would be. 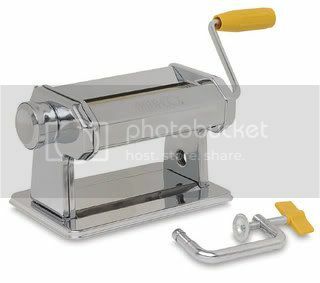 Chef Hale brought in fresh pasta dough, which we rolled using a pasta machine. You roll it out at 6 different settings, so that the dough gets thinner and thinner each time. I was expecting the dough to be fragile, but it wasn't. It was sticky, though. At first, we tried using a pasta press to form the ravioli...but it didn't work out too well for us. The main problem was that the dough stuck to the form (yeah, we didn't think to flour it) and the raviolis were destroyed. 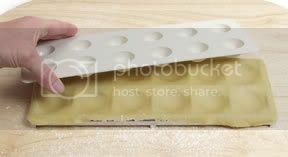 The cutter sealed the raviolis and created a nice edge. I was a bit worried that some of them had too much air inside and might break open during cooking. That didn't happen, though! All of the raviolis stayed together! 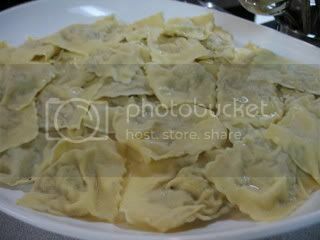 Our platter of beautiful, wrinkly ravioli! Be sure to clean your morels throughly by soaking them in cold, salted water and then in unsalted water. This will remove all the bugs and slugs and such. Dry the mushrooms well, then diced slice them. Saute mushrooms & onions in the oil. Season with salt & pepper. Deglaze the pan with wine. Add stock and thyme, then reduce by 3/4 and take off the heat. Cool slightly. Add cheese and mix well. Make sure the mixture is cool before adding to ravioli; chill in fridge if needed. Run a knife through the mixture to chop any large pieces before assembling ravioli. Be sure to flour your counter, sheet pan, board scraper, and whatever else you are using to assembly the ravioli. They are sticky little things. Once all the ravioli is assembled, keep them on a floured sheet pan covered with a damp towel so that they don't dry out. I boiled ours 8 at a time (you don't want to over-crowd the pot) in salted water for about 3 minutes each. 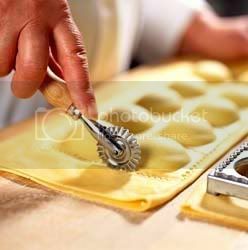 Scoop out each ravioli with a slotted spoon, shaking off all the extra water, and transfer to a serving plate. Repeat until all the ravioli are cooked. 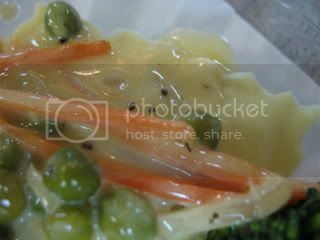 Chef Hale made a sauce of fresh English peas & carrots with white wine and butter. 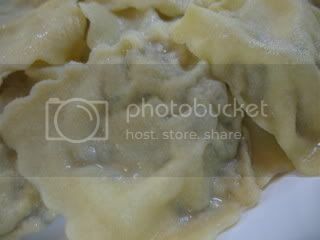 However, the ravioli are very flavorful by themselves--thanks to the morels & cheese--that they would be even better with just browned butter or a lighter sauce. The other groups in the class made small savory morel cheesecakes (to be eaten with crostini as an appetizer) and different morel sauces for beef, chicken, & fish (halibut cheeks!). Overall, I was very happy that I got to make the ravioli. Now, I am excited to try other ravioli recipes at home! In honor of morel season, I am submitting this recipe to Anh of Food Lover's Journey who's hosting this week's edition of Weekend Herb Blogging. That looks so freakin' good! I adore morel mushrooms. I also have the same pasta maker and ravioli maker.....your post has inspired me to get mine out. I am a mushroom fiend, but have yet to try morels. 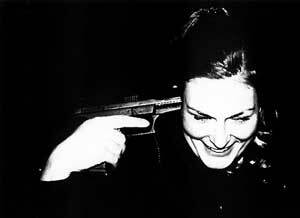 A pity, as I am sure I would love them. Nice work with the ravioli. Sounds delicious. I've never made any type of fresh pasta. BTW, I met the woman who owns Kitchen Conservatory once when I was visiting Alanna Kellogg; can't remember her name but she seemed very nice.